The nature of work has changed: no longer defined by four walls and 9-5, we’ve seen technology revolutionise how we connect and how we are productive. Cloud services and VPNs are simply the latest iteration in a long chain of innovation that has led to laptops, tablets and smartphones, alongside remote working and ‘business as a service’ models. It’s not just technology that has changed though: social notions of ‘work‘ have evolved too, with some newer, more agile organisations recognising that the real value is in the ‘work‘ done, not in slaving you to a desk or system for eight hours of the day. Many of the facets we associate with offices were mechanisms of control: cubicles, desks, computers, telephones, all infrastructure that we couldn’t get easily elsewhere. We were provided with the tools and expected to be grateful for them: maybe we were allowed a pot plant and a holiday photo to remind us of freedom. We exchanged our time for security: but that security is illusory. No longer is a job for life, instead it’s a stepping stone in a career that will cross organisations and sectors. A portfolio where the direction and skills needed are both under your control. In this environment, to attract the best talent, organisations need to adopt a model of talent magnetism more than talent management. They need to be the place that people know about and want to work, not the place that tries to hold people in with policies and infrastructure. In the Social Age, the relationship, the contract, between organisations and individuals has changed: it’s more about what each can do for the other, negotiated in terms of a year or two, maybe even just a few months, not a lifetime. It’s not a case if ‘if you move on‘, it’s a case of ‘when you move on‘, and the impacts of this are substantial: change programmes no longer generate the same engagement if you won’t be there to see the consequences, leaders need to draw on different forms of power if they want to have authority in the Social Age. Social Authority is that bestowed through the communities that suffuse our formal and social lives: it’s authority by permission and consensus. It’s authority that is fluid, not anchored in your position, not based in hierarchy, but instead grounded in your reputation, forged by your actions over time. Social Authority can fully subvert formal authority if the permission and amplification of the group is strong enough. In parallel with the rise of purely social authority, we see the erosion of formal hierarchies of power: those mechanisms that used to give status and authority are eroded by the evolved nature of work. 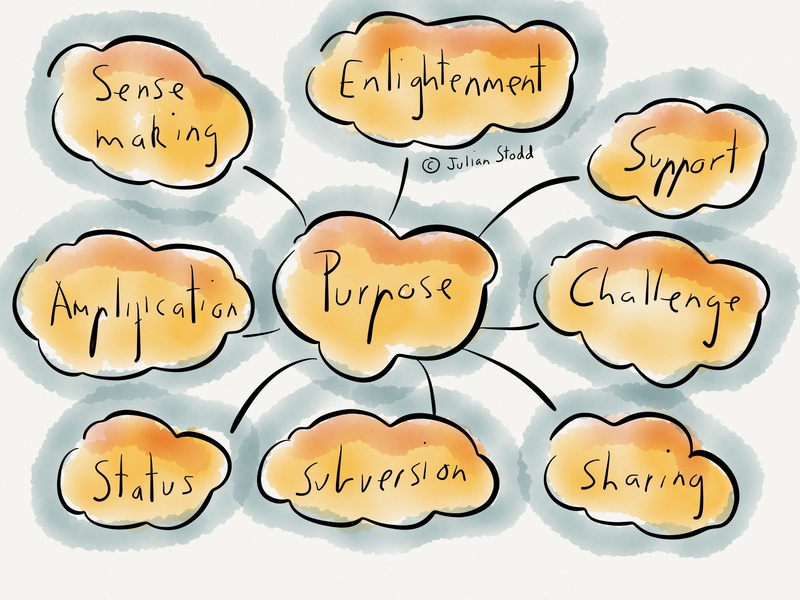 Organisations no longer hold individuals in thrall anymore: their power is more consensual. Holding the threat of a salary over someones head no longer works if they expect to be made redundant next year anyway. The security we used to be rewarded with is, at best, transient and with this transience it loses it’s power. Effective organisations in the Social Age forge partnerships and contracts with employees that recognise and reflect this. As the power of community grows, it follows us around: employ me and you get access to my community, and those communities serve ever more important sense making and storytelling functions. We make sense of the world around us through our communities in different ways, relying on them for challenge, for support, to help us subvert formal authority or dogma and perhaps to help us effect change. Communities can be subversive and can amplify change messages, but only if we engage on their terms. From the organisational perspective, getting these communities behind you is valuable, but it will only happen if you act with authenticity in thought, word and deed. It’s about the right conversations in the right spaces and our engagement in those conversations is consensual, with permission. And storytelling? 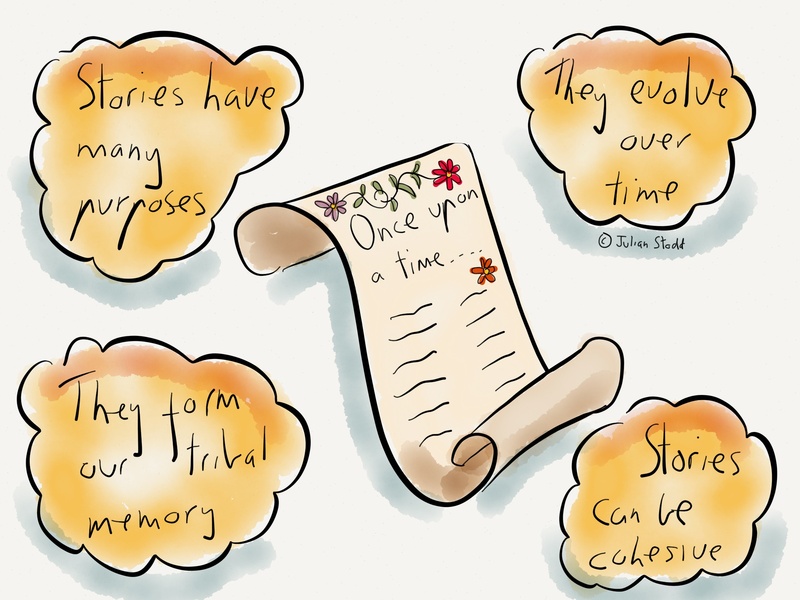 In the Social Age, stories have real power: both personal narratives, recounted through blogs, LinkedIn and Twitter, or co-created group narratives that feed into overall stories of organisational change. Being an effective storyteller enhances your reputation and sits right at the heart of social leadership and learning. Organisations need stories too: but ones spoken in authentic tones of voice, with clarity, brevity and agility. Not dogma: living stories that ring true. Change is constant: it’s easy to say, but harder to master, but mastering it is what we must do. It’s about thriving on change because we are agile, able to make decisions tomorrow, within and alongside our communities, then do it again differently the day after: process and systems that attempt to codify actions into repeatable patterns may be unable to react in time. Agility is more a mindset than a system. Survival is easy: it’s about learning to thrive in this state. If we live under stress (either personally or organisationally), we cannot thrive. We need to create spaces for innovation, unleash creative processes within teams and become agile. To do this, we need Social Leadership: leadership that exists in social as well as formal spaces. 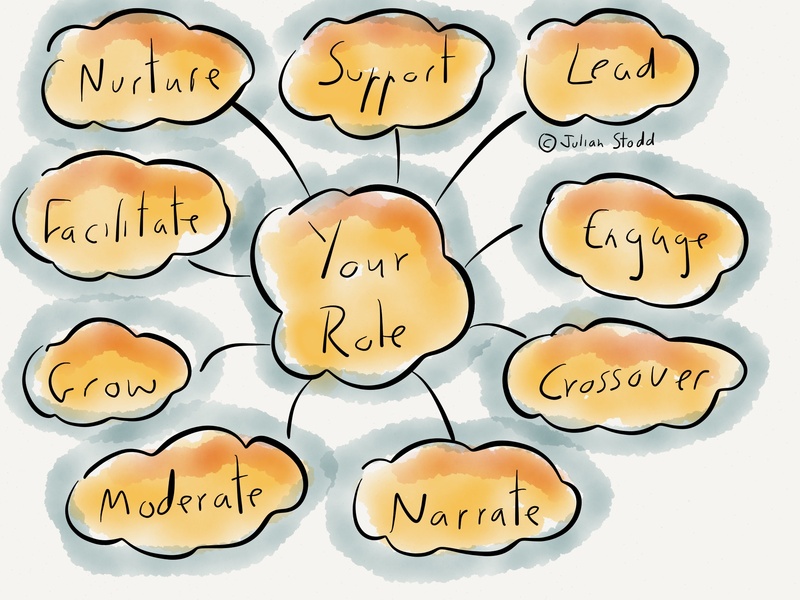 The core skills of the social leader are around narrative, engagement and technology: taking their stance, forming and sharing narratives, nurturing and developing teams and collaborating widely. Social leadership compliments formal and hierarchical leadership and is essential at a time when that formal authority is being eroded. It’s reputation based, judged on our action and consistency over time and can be highly contextual. 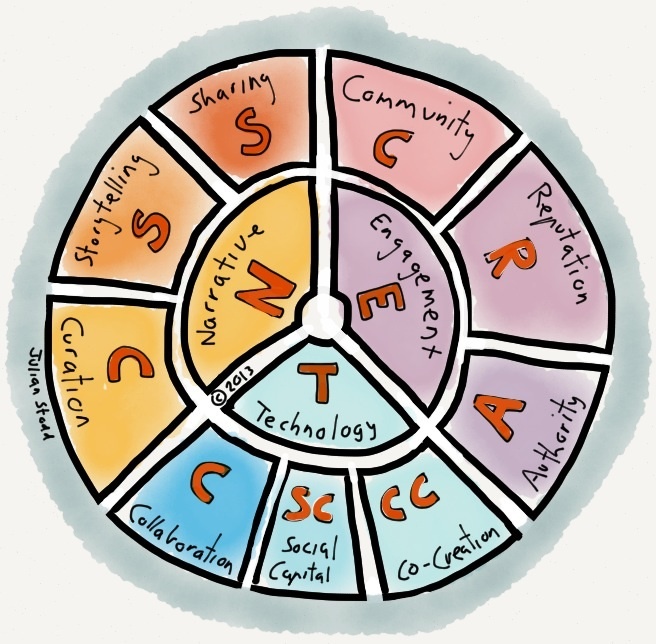 Alongside this model of social leadership, we need approaches to social learning: it’s no longer about providing materials for people to learn and be tested on like parrots, more about creating spaces and a matrix of resources for people to engage with to create meaning. It’s about scaffolded social learning environments where we facilitate, nurture and support learning. We use narrative and communities to ‘sense make‘ the subject and tell their stories out of it. No production line here: the challenge for organisations is to facilitate it through systems and mindsets that allow people to learn rather than getting in the way. And this learning will doubtless cross the border to the outside world: so many resources sit outside the organisation, we have to provide access and tools for sharing. The organisation cannot curate the sum total of learning needed, because we are all different. It’s about helping people to learn, not making them do it. We see learning getting more responsive, shorter, but it also has to be better: we have to utilise a rigorous methodology to ensure there is structure, but a fluid one. Setting the context, demonstrating core principles, providing spaces for exploration and reflection, taking creating approaches to assessment and providing clear footsteps to bridge the gap back into the real world. So much organisational learning is abstract, divorced from the reality of the learner: it’s time to anchor it firmly in the real world. More than anything, we need socially responsible businesses: ones that are fair and inclusive and that provide permissions and resources to allow both organisation and individuals to thrive. They need to unlock the creativity and innovation within teams, provide social leadership and spaces for experimentation and permissions to learn. The Social Age surrounds and engulfs us in waves of change, both social and technical. We need to be agile in behaviour, process and structure to thrive. We have to create spaces for experimentation and permission to do so. It’s an exciting time to come together in communities to do this. 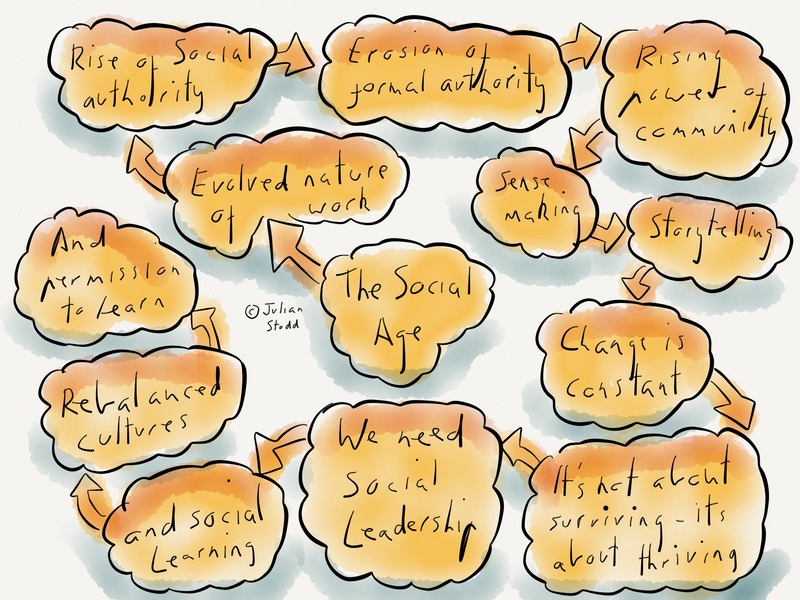 This entry was posted in Agile, Change, Community, Learning, Social Learning and tagged Agile, Change, Leadership, Social Age, Social Authority, Social Leadership, Social Learning, Socially Responsible Business, Work. Bookmark the permalink. It’s all about communication – with our colleagues and with our patients. It’ll have pitfalls (change always does), but I can’t wait to see where we take it from here! Absolutely Nick, enhanced speed and channels of communication fuel the changes of the Social Age: you’re seeing it in Healthcare as well as more widely. As the ways we interact with pure ‘knowledge’ alone evolve, the nature and content of those conversations changes too. As our reputation becomes based less on what you know, more about the meaning you can create with that information, within and alongside your communities. What a GREAT post about the importance of being aware of the shift in our business ecosystem.